The third 16 have been watched and weighted and whittled down to 8. 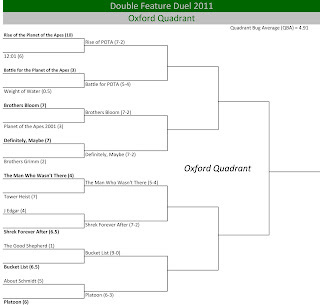 The previous two quadrants are both going to be represented in the Final Four by 10 bug films in Big Fish and The Nines. 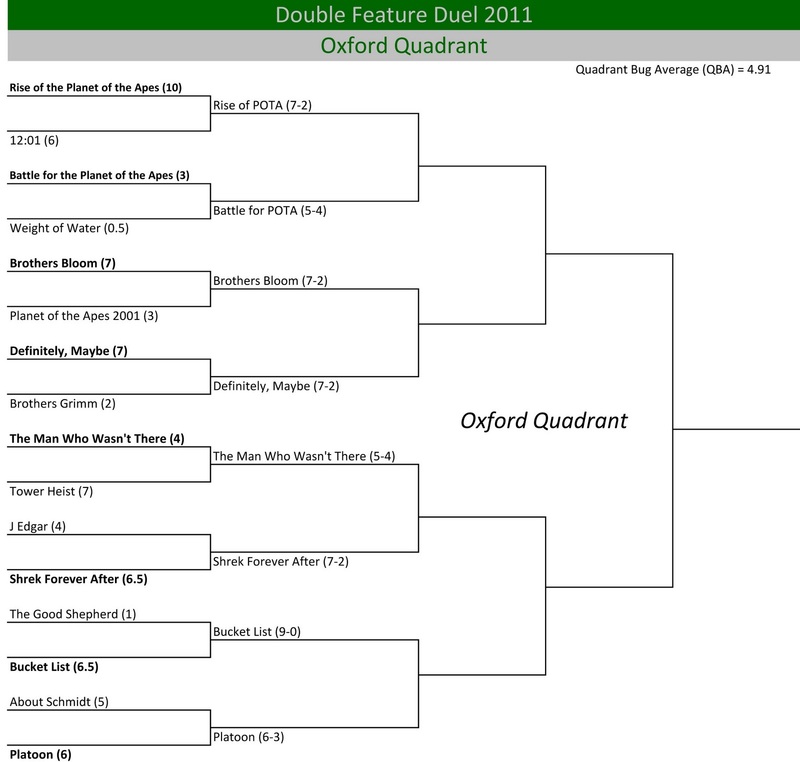 The Oxford Quadrant also has that opportunity with Rise of the Planet of the Apes, but that doesn’t necessarily make it a guarantee. After all, we’ve already seen the tournament’s biggest upset in The Man Who Wasn’t There (4) knock off Tower Heist (7) in the first round. Who the heck knows what mood I’ll be in on any given minute? Whether it’s indicative of my grading getting harsher as we go on or maybe I’m just watching worse and worse movies, the QBA (Quadrant Bug Average) has been continually going down from 6.31 in the Philadelphia Quadrant to a 5.91 in the Baltimore Quadrant to a less-than-average 4.91 in the Oxford Quadrant. Thankfully, I’m all through with the Planet of the Apes franchise and can get onto the potential Oscar nominees in the DC Quadrant. And then hopefully, I can stop doing this for good. Because this ridiculous endeavor is eating up way too much of my damn website and writing efforts. But for now, let the games continue.